It's as if the tree wanted to be a circus star and the net was there to catch it just in case it fell. . . . and Fall, it did! 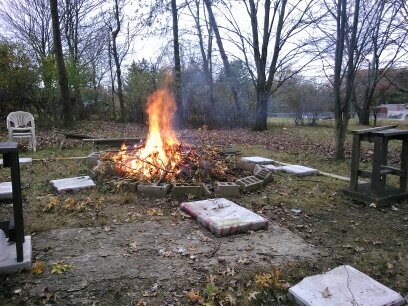 On Sunday, my hubby, kids and I went out and worked several hours on breaking the tree down and either disposing of it, via a nice, warm bonfire. . .
or saving the wood for future use. It will be good fire wood for camping or to save in case the electricity ever goes out. . . . . although we don't have a fireplace or a wood burning stove at this point. The trees (haha, when you type too fast, "trees" do things!) 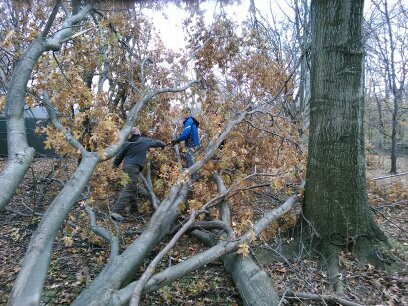 The KIDS were climbing in the downed tree and trying to lop off smaller branches. And then they were tasked with stacking the wood in the smaller "barn." I learned how to use a Sawzall to cut some of the branches off from the trunks and at one point tried my hand at using a chainsaw. There are NO pictures of me using a chainsaw because my hubby was actually helping me hold it -- I was a little nervous! 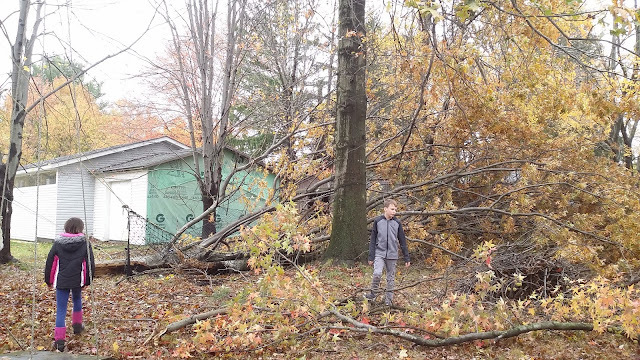 So, he couldn't help me hold the chainsaw AND take the picture at the same time. By the way. . .. . I'm removing one of the things that won't end up happening on my 50 Before Fifty list and replacing it with " Use Chainsaw " Haha! My hubby was cutting some of the pieces up. . . . okay, a lot of the pieces up, and he thought this little y-branch looked like my legs. . . Hahaha! We got about half or maybe a little more than half of the tree taken care of. We definitely made some progress! Sounds crazy, but it was a fun family day spent outdoors. As soon as we were going to call it a day, little ice pellets began falling on us. Perfect timing! It was almost dark out. Luckily, we had thrown a ham in the oven, so dinner was half done. Teamwork makes the Dream work! 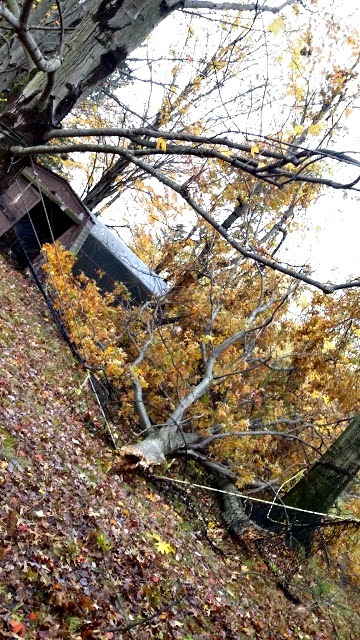 😉 The family that processes downed trees together stays together?? ?